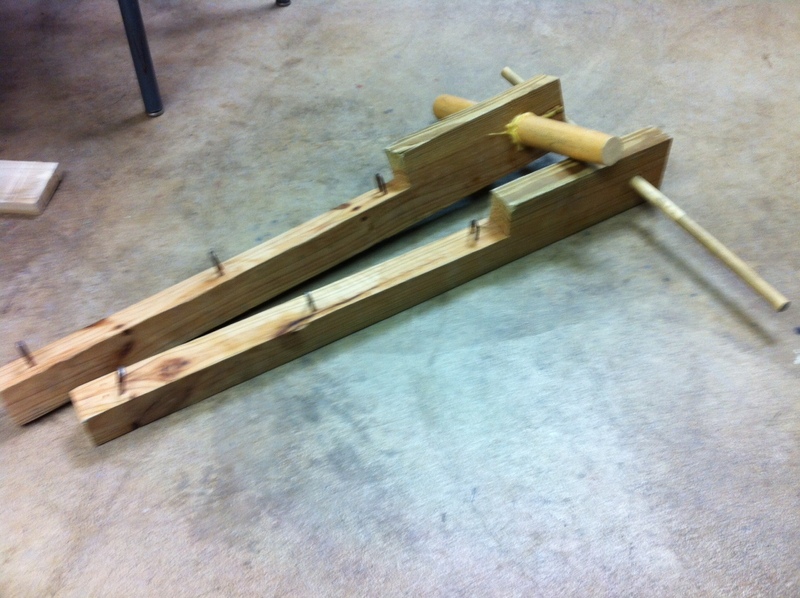 I like to introduce the concept of torque with “wimp sticks.” Wimp sticks have a handle which can be held by a student and a few hooks on which a mass can be hung. As the mass is moved farther from the handle, a greater torque must be applied by the student to keep the stick level. This difference is easily felt and demonstrates how the distance from the axis of rotation (the length of the lever arm) is proportional to the torque exerted by a constant force. The part of the demonstration which further emphasizes the effect of the lever arm is when I give a second “wimp stick” to another student so he can have the same experience and feel the torque. (I choose both students carefully to avoid anyone who may feel embarrassed. This year, I picked two robotics students.) This second wimp stick has a much smaller diameter handle as is difficult to hold level without any additional mass and impossible to hold level with additional mass. We then as a class discuss if the student is as weak as he appears or if something else is having an effect. This discussion highlights that there are two torques which must be balance for the stick to remain level and that there are two different lever arms.